The Order of Time: Science - Galactic Time: How? When Julius Caesar introduced the new calendar in 45 B.C. the old lunar calendar was abolished. On itself the calendar was conceived beautifully transposing the division of the lunar calendar to the solar year. But actually the roman empire dropped out of the consciousness of the moonrhythm and thus lost touch with its roots of conditioning. Instead of an expansion to the complete of the reality of time adding the respect for the sun to the already existing moon-culture, it became a repression of the moonrhytm by the sunrhythm. Both rhythms are correct in themselves, but the natural consciousness of knowing the difference between the old conditioning of the moon and the new one to the sun, was not achieved. In 425 A.D. the roman empire fell after centuries of corrupt emperors like Nero and Caligula, overtaken by the barbarian forces who managed... a mooncalender. At that time at the onset of the christian era the julian rhythm of the solar weekorder was repressed with the commercial/religious order of the present weekorder, which introduced linear time estranged from the natural dynamics of time one formerly respected. This linear time later culminated in our present standard time of linear management and is purely political of nature in its implementation. In the eight century Islam came about countering the then troublesome progressing christian culture which had lost touch with the classical roman and greek culture. Plato was abolished as heretic and many old sciences were forgotten. The roman sundial (the cupped one of the Babylonian Berosos from 500 B.C.. ) was abolished and replaced with the ancient flat one giving regular hours but with with one lost sight of the times of sunset and sunrise. Islam adhered to a purely lunar calendar and prayertimes to the position of the sun and tried to conquer Europe. They defeated Byzantium, but never succeeded to impose the culture of their respect for the natural order on the Europeans. Again repression of one system by the other turned out to be unsuccessful. At the end of the Middle Ages the concept of time mechanized with the rise of popular mechanical clocks that after a few centuries started to contest the natural order making mean time, zonetime and summertime, thus separating the concept of time from the concept of space. Breaking the classical alliance of the two, mankind lost thus sight of cyclic time and the natural oneness of time and place (although by Einsteins physics we achieved to a scientific respect for the relative of time and place.) In the twentiest century the repression of the cyclic time of respecting the heavenly bodies by the linear concept of mechanical electromagnetic atomic time resulted in a total self-alienation of mankind as evidenced by two gruesome worldwars in which Christianity had to pay for its offenses against the natural balance of time and space. Soldiers of Hitler Germany died in Stalingrad with the time of Berlin still on their watches. (there are more possible causes to these wars of course). For the third time mankind had to pay heavily for its repression of the old by the new. From the multifaith culture we cannot escape anymore from a diversity of timeconcepts. The cultures all together command an integrative approach forbidding repression and downfall again. The mission with this digital culture in the twenty-first century is to arrive at a full concept of order that is in respect with as well the sun, the moon as with the celestial sky. The respect for cyclic time needs to be restored in making for a worldorder that is capable of doing justice to each individual timeculture on this planet. solar and lunar months. (from Filognosy: filognostic art). The day settled for respecting the event of being closest to the center of the galaxy is timed at midnight UTC of the the year 2000 from the sixth to the seventh of July. (eventually there can be an astronomical correction to this timing as it is a first estimate from a formerly not existing culture of galactic timerespect). VLAimage of the galactic center showing a three armed minispiral of hot gas. Sagittarius A, the 'navel of Vishnu ' is at the exact center of the spiral. "I would insert 1 day into the rotation each 71 years and skip the additional day each 8 rotations. Doing it this way you would still drift over the 25800 years very slowly. You could also add 1 hour each 3 years." Thus galactic time can be respected. 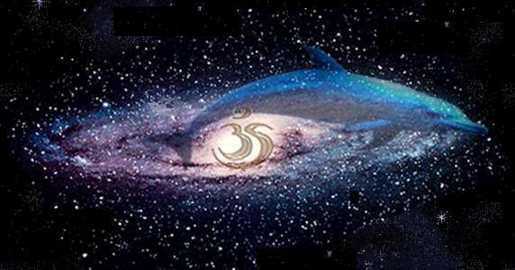 The symbol is a dolphin, the name is Cakra. We wish you a happy galactic new year from the 6/7 of July 2000 on into the years thereafter .